So I’ve previous discussed Injury Shaming in the music field, as specifically related to employment, education, festivals, etc. However, I did want to discuss some of the other issues related to injury treatment and recovery, as pertaining to musicians. First, let's look at some of the problems with seeing medical professionals about a musical issue. 1. The classic answer to overuse injuries, which sometimes prevents musicians from seeking medical attention for more serious issues, is "stop playing and take some anti-inflammatory drugs." Let’s be clear, rest is important. But if the solution is to tell people to completely stop their career without looking at the whole picture of what’s creating an injury, we’re setting up for a problem. While there are some fabulous medical professionals out there willing to look deeper, many musicians don't seek help as quickly as they might otherwise because they receive a less-than-helpful answer for a long term solution. If music is your profession and how you make money, then having a medical professional dismiss your concerns is incredibly insulting. Also, about those anti-inflammatory drugs- inflammation is your body's way of bring more blood to an area that has been damaged, irritated, infected, etc. It can be a way of protecting against further damage, (unless we're talking chronic inflammation, which changes the type of cells present at the site), and is accompanied by pain, swelling, redness, and heat. When we constantly and repetitively take NSAIDs (non steroidal anti-inflammatory drugs), we are disrupting our body's process for dealing with tissue damage. Interesting. Another stat I heard in an interview with Jonathan FitzGordon stated that while Americans make up only 4.5% of the world's population, we use 80% of the world's (!) pain-killers. Yikes! Maybe it's time to reconsider a few things? 2. While healthcare reform is a great thing for us musicians, especially freelancers, it's been a long time coming, and many of us have had to pay for some expensive stuff along the way. Because of my pre-existing condition, I was denied healthcare and paid out of pocket, which was awful. Even now, many insurance policies have a high deductible which may discourage patients from seeking the treatment they need because of the high up front cost. (If a deductible is $1500, that means that you will pay all costs up to that deductible, which can be a lot of money! MRI's are very expensive...) In addition, that can prevent musicians from getting the PT, regular check ups, and care they need long-term. 3. Many homeopathic and alternative treatments are not covered by insurance- acupuncture, chiropracter, rolfing, etc. For a musician in a professional orchestra with a good salary, that might be ok, but for a freelancer or someone with a lower salary, paying $140 for one session is prohibitive. I had a rolfing session (structural integration) which was amazing, and really changed how I felt in my muscles and soft tissues, but it was really expensive and I can't justify going again for a long time. I would love to see more professionals offer their services at a discounted or sliding rate for people who could benefit from their services but can't afford it. I know there are quite a few great community acupuncture clinics in the US-what about sliding scale rates for other modalities? Yoga, pilates, and gyms can be outrageously (!) expensive, and I know that also turns people off too. In my fantasy land, orchestras, schools, and arts organizations would make health a priority for their employees/students by supporting these resources, rather than expecting students to pay out of pocket. 4. Many musician injuries are chronic. A musician might stop playing for a bit, and feel ok, and then 6 months later, the pain comes back. We need to both look at our own actions and how we're contributing to our own pain, but we also need medical professionals who are interested in creating long term change, not just a treatment of symptoms. It's a combination of taking responsibility for one's own health, combined with assistance from homeopathic and allopathic folks interested in changing the problem, not the symptoms. 5. Lastly, it's really hard to be injured, in pain, or with undiagnosed symptoms of illness. A few years ago, I was consistently unwell. I had headaches, digestion issues, low energy, etc., many of which were difficult to treat or identify. After a period of a few months, I was eventually diagnosed with a non-cancerous pituitary brain tumor, which explained a lot of my issues. Yet, during that time of non-diagnosis, I felt terrible. Generally, we like to take steps in maintaining our health, to be in control if possible. If we move enough and eat vegetables and sleep well, we expect to feel ok. When those things don't happen, it can be devastating, regardless of the injury or issue. RSI's don't go away quickly, and there's rarely a quick fix solution. The process of healing and diagnosis can be very stressful in and of itself, especially if the body doesn't heal itself quickly. That combines with the stress of school or a job and a lack of compassion in both the medical and job/education setting can be damaging long term. Is Yoga for Everyone? Yes...and No. Many of you know me as a violist/yoga teacher, which often leads people to think that I want everyone to do yoga. This is not true, and here's why: Yoga is not a magical therapeutic movement modality, as many people seem to think it is, and many "traditional" poses can be quite injurious. Yoga still has the power to be a transformative and amazing movement modality, but not all yoga practices and classes are equal, nor are they all beneficial for musicians (and normal people). Side note, the initial conception of yoga was multilayered, not just consisting of poses. There are other limbs of yoga that are fantastic and worth exploring, they just don't always come up in the context of a one hour class. Yoga asana, as taught in the west, is undergoing a revolution of thought, in that for many years, teachers and students have perpetuated the notion that "any pose is possible if you practice diligently." This is simply not true, nor is it a helpful notion if you're working with restriction or past injury. Every single body is different in terms of bony restriction, muscles, etc., and not every pose is right for every person. I will most likely never get my foot behind my head, and I'm totally fine with that. You may have heard comments in a classroom like "find your edge" and "push your limit" juxtaposed with contradictory statements like "listen to your body." What the heck does that even mean? If you're a musician with wrist issues or shoulder issues, those comments are not helpful, and don't help to find individual limits. In addition, a majority of traditional yoga poses will put extra weight on the wrists (in extension, no less), and put the shoulders into extreme ranges of motion. There is often a praising of people who can do the "hard poses" which often demand a lot of flexibility, often in extreme ranges, which shouldn't really be the "goal." I've been in many a yoga class in which a difficult backbend series was called out, and the most bendy person was used as an example for what You or I might achieve if we work hard. This is not necessarily true, and not necessarily in line with my goals as a movement practitioner. For that reason, I've been re-evaluating my yoga practice and changing how I teach movement and yoga over the last few years. I no longer seek out intense, end-range glorifying yoga classes, and I have a lot less attachment to specific complex poses. I'm happy to never be the "demo" body for deep or complex poses, and I'd rather do my own thing in the back. I love slow, down-regulating practices, that allow me to mindfully move with my body. I also do other movement practices besides yoga, and don't expect yoga to be a complete body workout/movement plan. Here are some considerations for starting yoga or just rethinking your yoga practice. 1. If you're interested in trying yoga but have a history of arm, wrist, or shoulder injuries, look for a class that has gentle, hatha, yoga therapy, slow, etc. in the title. Even if you're healthy, it's great to start with the basics, even if you're a health and active person. The more dynamic styles (flow, vinyasa, ashtanga) are difficult to jump right into, and often don't offer a range of accommodations for traditional poses (such as plank, chaturanga, DFD). There isn't always time to break down poses either, as it is assumed that one is already familiar with them. Kino McGregor is a famous (and pretty darn flexible) ashtanga teacher. I have ZERO interest in getting here, nor is that really even on the radar for me. If you can do it, great, if not, you can still live a happy yoga life without it. 2. Doctors often tell patients to practice yoga if they have back pain, or tell them to strengthen their core. This is not the most helpful advice, as there isn't necessarily a correlation between core strength and back pain. More importantly, there are a million styles of yoga, and many would in fact be challenging for managing back pain. Meeting with a teacher one on one, working with a yoga therapist, going to class aimed at back pain ...these will help more than a general class. Group classes are not always a great way to get specialized attention, and one on one is infinitely more helpful, especially if you come in with injuries or a pain history. 3. Read the biographies of your teachers or possible teachers. Look for teachers with anatomical knowledge and experience who can tailor movement to you. The last thing you want is a teacher who can't help you with form or modification, or who has no experience with shoulder or wrist injuries. 4. Try not to think of yoga as your workout. When we think of yoga in this way, we often gravitate towards hot room/hard poses/move fast, which can often cloud our integrity of movement, especially if we're vulnerable physically. If you're healthy and have never had a problem with hot room vinyasa/bikram, that's great, but for a beginner or sensitive person, I would say start slow and at room temperature! 5. Ask yourself why you're doing yoga, what you like about it, and what your goals are. (To be more flexible, to learn how to breathe better, to combine mind and body, whatever). Make sure that the class you're attending serves that goal, and if not, try a different class, or a different movement practice. 6. And lastly, only do as much as you can with integrity. This is something I try to apply to most movement practices (crossfit! weight lifting! ), but only do as much as you can with integrity of movement, good alignment, and feeling like you can breathe. If a teacher or class is pushing you to a place you're not comfortable or able to go, don't do it. I've skipped MANY a teacher cue, and done just fine. At the end of the day, I like many things about yoga, and I dislike many things about yoga. (That's a rant for a different day and a different blog). I also like walking, swimming, jumping, lifting weights (yes), pilates, and trying different movement practices. As a teacher, I also want my students and colleagues to be strong, mobile, and pain-free. If another movement practice takes them there, that's great. It doesn't have to be yoga. A few months ago, I opened a big ol' can of worms with the discussion of how stretching doesn't actually lengthen muscles. Now, it's time to address that subject again, with the help of Stretch Armstrong, which some of you may remember from your youth. If you're a child of the 70's or 80's, you may remember this toy, clad in a speedo or a tee-shirt, depending on the decade that you lived in. In case you missed our previous chat, take a moment to catch up on the last post in case things are a bit confusing. Basically, in many movement disciplines, teachers and professionals perpetuate the idea that we must stretch muscles to lengthen them. Period. I went to a few yoga classes this weekend, both of which said this. "We just lengthened your hamstrings a bit so you should feel open." Being the slight know it all that I am, it's time to correct that notion and learn a little more about the science of stretch. This pose, a pigeon variation, is often a "dream goal" pose for yoga folks. Does this degree of spinal flexibility necessarily serve us all? Perhaps not. Back to Stretch Armstrong-there's an idea in yoga and in other movement disciplines that the infinite stretchability is the goal, AKA. stretchier=better=magical poses and feats. Yet, like Stretch Armstrong, when we stretch things, our body (hopefully!) goes back to the initial tissue length...depending on how intensely we stretched our tissues. - Our flexibility is heavily governed by our tolerance, which means that our nervous system prevents us from going into ranges that we don't frequently use (like the splits! ), because it's unfamiliar and potentially risky. Over the course of a yoga class, for example, your tolerance will change because your nervous system is allowing range, the muscle isn't actually lengthening. (Remember how you might be flexible in a hot yoga class and then the next day, it's like it never happened? Your hamstrings are the same as ever? That's because of a phenomena called Creep and Recovery (which is how the body recovers from stretching back to its normal resting position). Stretch Armstrong does not have this capacity, nor does he have a nervous system (unless he's some hybrid of Chucky and that's just eerie). I took this picture at a zoo last year- I loved the one sedentary zebra juxtaposed with the crazy rolling zebra. We tend to be a teensy bit sedentary which affects our range of motion and flexibility-lets move more, folks! What is flexiblity? Basically, flexibility is having a normal range of motion in your whole body. Therefore, if you DO NOT have normal range of motion, stretching can help work that range and then it's time to strengthen. Remember that stretching for stretching's sake will not help much, but a combination of stretching and strengthening will help create sustainable change. Moving frequently in more ranges of motion will help most (read more here!). Time out: I've done yoga for 7-8 years and stretched my hamstrings for a long time, with little change. What helped is actually getting a standing desk, wearing flat shoes, and walking more. Fascinating- I needed to gain strength in more ranges. Lunges, standing yoga poses, walking, squats- these are all strengthening poses and movements. Whatever range you're trying to change (hamstrings, shoulders,etc.) also requires strength at that range- you don't want to stretch without supported strength. 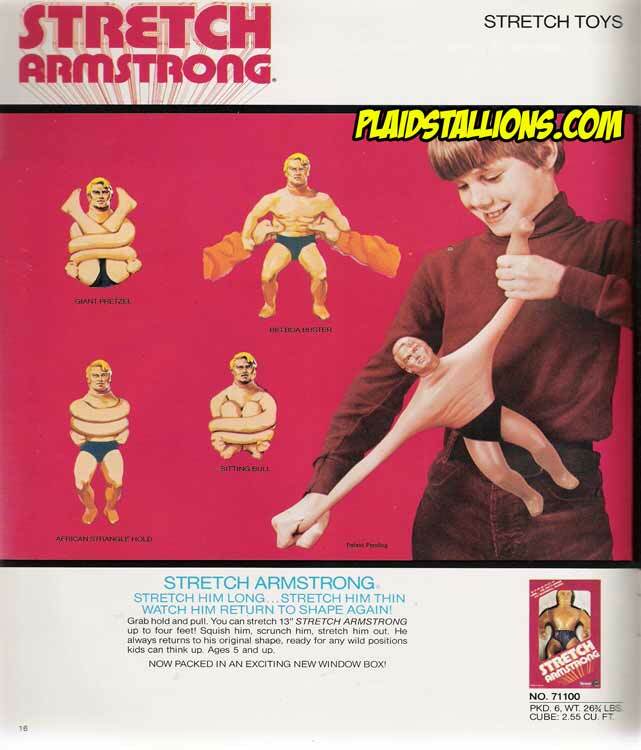 So while Stretch Armstrong's stretchability implies that muscles are infinitely lengthen-able, in fact, your goal should be to expand your range first and then strengthen. Don't just keep stretching and "lengthening" tissues! Read more about your "short hamstrings" here with Jules Mitchell's awesome post. I opened up a chat with some of my fellow teachers last month inquiring about why we stretch, and I love what my colleagues had to say (Thanks Alex E. and Alexa P.!) Here's what one of my teachers, the brilliant and fabulous Sarah Court said, "Losing healthy range of motion sets you up for injury. Stretching is not about trying to change the length of anything, rather you are trying to optimize overall mobility and not lose movement options from lack of use." The conclusion? Stretch (a little bit) to regain mobility and move better, then strengthen and move more. Stretching the same thing every day? Maybe not so much, unless you're Stretch Armstrong in the hands of a seven year old.